What do I mean by Naked CRM? If you undress CRM to the bare essentials what are you left with? So when you are thinking of CRM and implementing CRM focus on the bare essentials first and dress later. The link below is very informative regarding options for mass emailing your data in CRM. In addition to the options outlined your emails can contain html addressable content via following the process outlined in the following article: HTML content can be added to all email methods by the following the article steps. 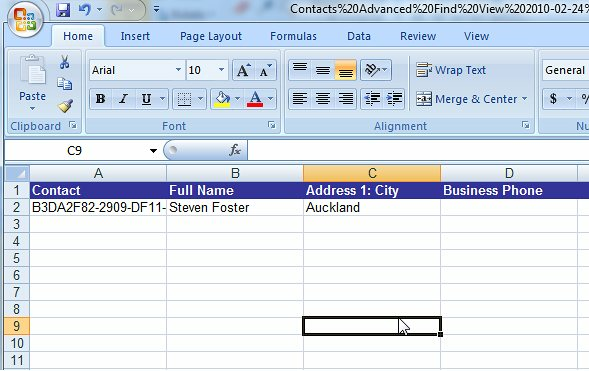 One point to note is that Microsoft CRM does not support mult-part emails so if you need to send both text or HTML then you will need to capture this on the contact record and use some intelligence in selection or workflow to work out which template to use either the HTML one or the plain text one. So how is this done you say … and was this not a feature that was turned off pre version 4 launch?? The secret feature revealed …. Select Next and you will now see a new option at top of screen “Enrich data …”. Leave this clicked and the data map should have defaulted to automatic. Review data exported and review the updated records. That Simple!!! Please not that after installing rollup 9 you are no longer requried to insert column A and copy the last column to it (Step 4). This column is already populated with the GUID of the record type. Just leave it as is and change the values in the other columns to enrich the data. This is a great blog on the new features of CRM5. This is a great link to an overview of workflow basics and what each action means. Only certain processes can be run by specific users. I.e. a finance person can only run the payment process on demand workflow to update a record status to Paid. The workflow scope refers to the security role privelege of workflow. If a user has organisation view of workflows then they will be able to see all on demand workflows, if the user has business unit view then they will be able to see all ondemand workflows that have been created by users within their business unit. If the user has User view then they will only see ondemand workflows that have been created by them or that they have been shared to. So to enable certain people to see ondemand workflows and some people to not requires playing around with the user privelges and the workflow scope. One way of doing this is giving the majority of roles only user read access to workflows and then setting all ondemand workflows to user scope. Then for each on demand workflow that needs to be assigned to users to run they are shared either directly to the user or by using teams. Using teams will enable you to add and remove users without updating the sharing rights of each and every workflow. Alternatively if you are using business unit structure then you could use a business unit level read access and workflow scope and then only people in that business unit will see the specific ondemand workflows.